In a world full of choices, creating a professional image for your business or service is essential to set yourself apart. And a logo is often the first representation people see so, it is crucial that you make the right impression from the beginning. Unique design thought, and creativity will help you achieve a high-quality visual identity, making your logo immediately recognisable, inspiring trust, admiration and loyalty. The chances are that you have seen thousands of different logo designs throughout your life, but which ones stick in your mind?. Do you have a favourite iconic logo? Is there a story behind it? We would love to know if you have a favourite. We are in a world full of design, business, culture and nostalgia so it is important that your brand connects in a memorable way. So, having your logo woven onto a badge will help you achieve that connection. Just, as it has for many UK logo designs that all serve as indicators of values, loyalty, and togetherness from companies like British Airways, BT, Virgin Media and the quintessentially Team GB British UK Logo. All woven onto cloth to give them a unique look and worn with pride. Woven badges are a key element to many of our emergency services including the military and the police etc. all worn with a strong focus on pride. This also applies to many sports groups, clubs, youth organisations, fashion markets and commercial companies all over the world, and no wonder they are the ultimate identification accessory. 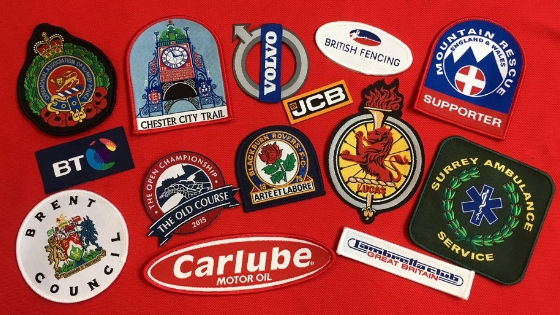 Of course, there are many ways you can showcase your logo or symbol, but woven badges can make the design stand out professionally even with the finest intricate details and colour. Thus making them a cost-effective smart and confident way to portray your brand identity. Jacquard Weaving specialise in woven badges giving you unique identity which can be appliqued permanantly on to garments. Made to the highest standards from our British mill in Lancashire where we have been weaving since 1972 and we feel proud to be a British manufacturer still weaving today. So, if you are ready to discuss your design options contact a member of our friendly design team today on 01254 830681 deb@jacquard.co.uk.